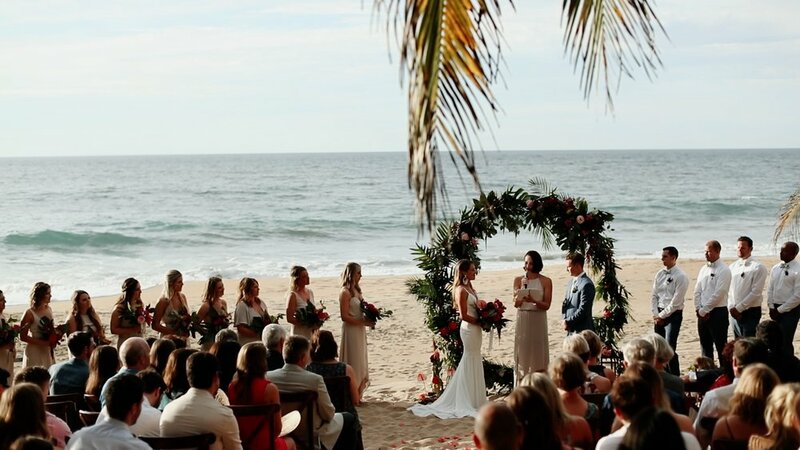 Carolyn + Slater planed a destination wedding weekend for 150 of their closest friends + family down in Sayulita, which is a little fishing village on the west coast of Mexico in the state of Nayarit. 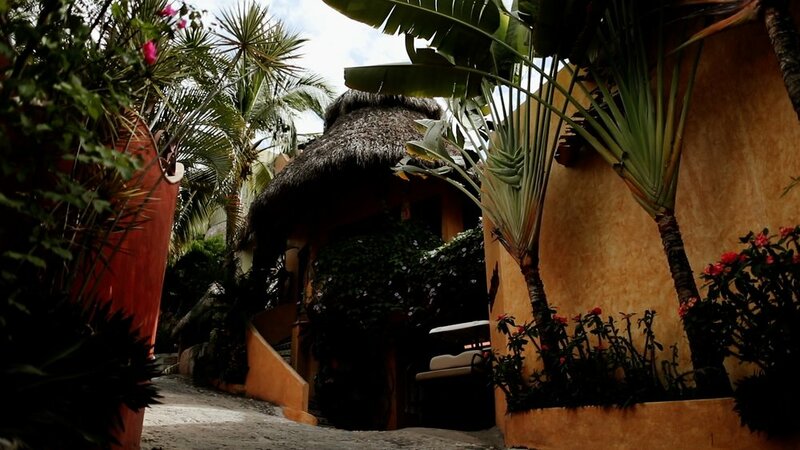 It is a charming little town that has an “old Mexico” vibe with its cobblestone streets and colorful buildings. 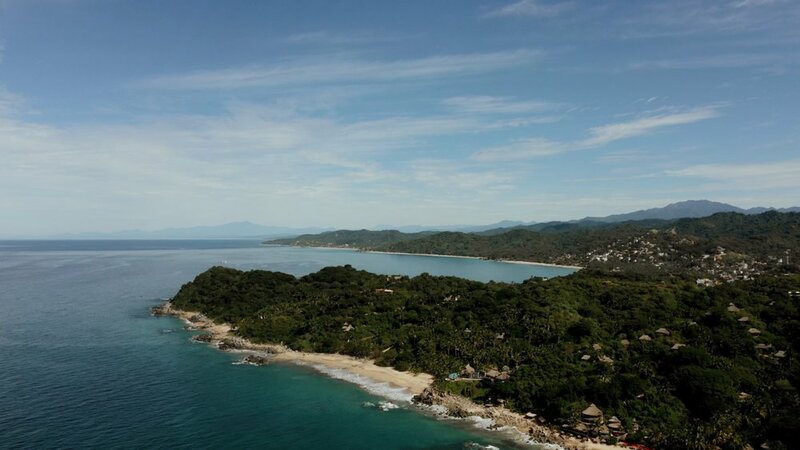 We first became familiar with this slice of heaven as it is the setting for one of Allison’s guiltiest pleasures, Bachelor In Paradise. 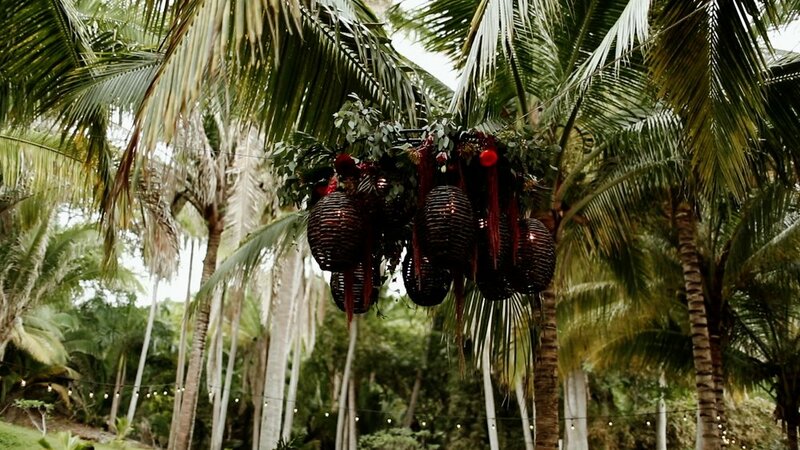 They held their wedding at the stunning Teitiare Estate that sits right on a private slice of beach overlooking the ocean, surrounded by a palm-tree filled jungle. 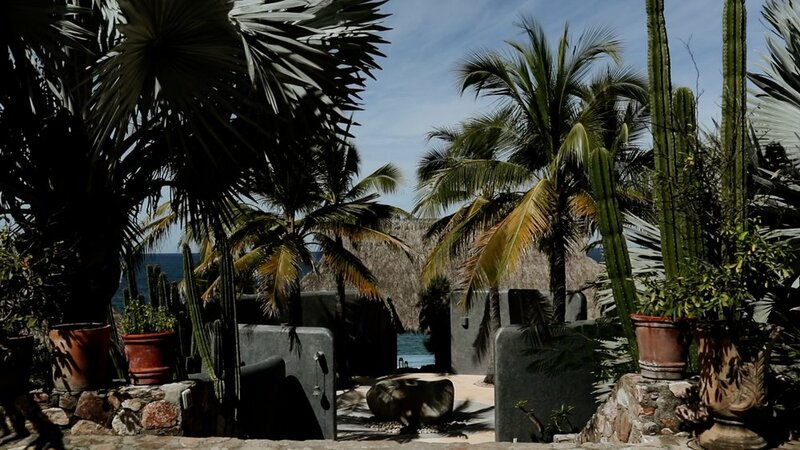 The venue is naturally beautiful, with a beachy, bohemian vibe. It was THE PERFECT setting for this adventurous, laid-back, free-spirited couple to host their destination wedding. The vibe of their day was relaxed and fun, with touches of tropical bohemian flair and pops of color all throughout. 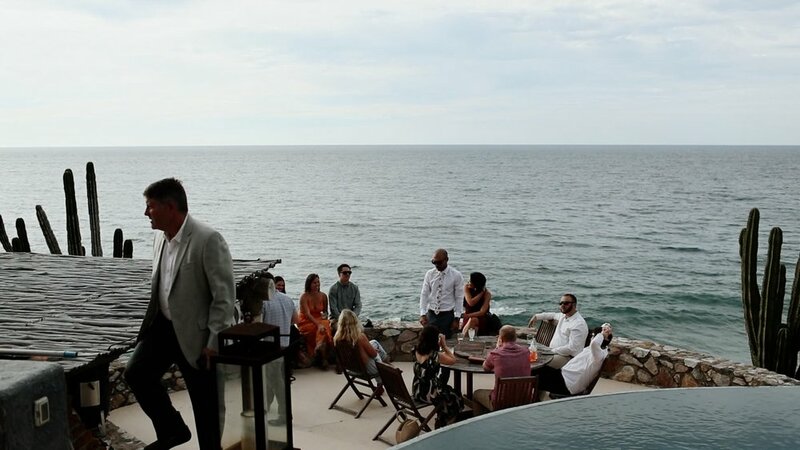 Carolyn + her ladies got ready in the Casa O’Te Miti villa at Teitiare Estate, which sits on a rocky cliff point that has one of the most jaw-dropping views of the ocean and beach below. When we arrived to the estate, we found Carolyn + her girls all lounging around the infinity pool. We love when our couples get to have time incorporated into the mornings of their weddings to just chill out, relax, and take in every minute of what is happening! Carolyn got ready on the balcony of the beautiful suites at the estate. She wore two bridal gowns on their wedding day — one dress she wore down the aisle and later in the evening she changed into her reception dress which was a little more boho-inspired with fun tassels hanging on the train of her dress! 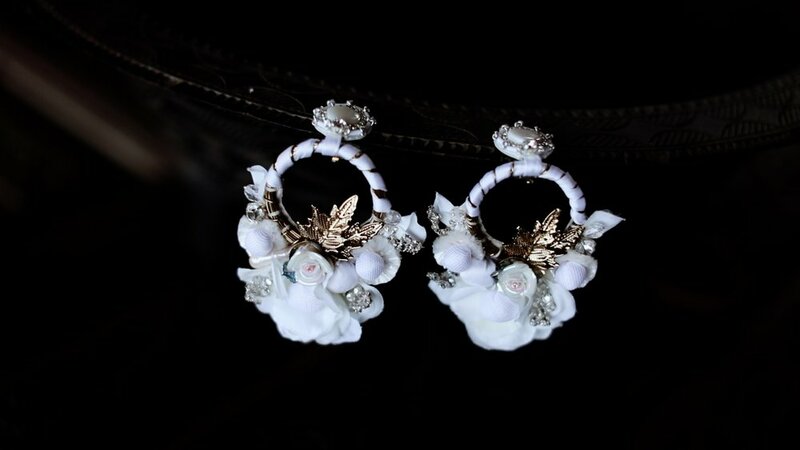 One of my favorite parts of her wedding day look were her statement earrings. They were PERFECT. Nearby, Slater and his groomsmen got ready in a charming, colorful Airbnb that they had rented out for their wedding weekend. We loved Slate’s custom made blue suit. It was the perfect vibe for their tropical beach wedding — not to mention that floral tie, which tied ( ha, get it! ) the entire look together. 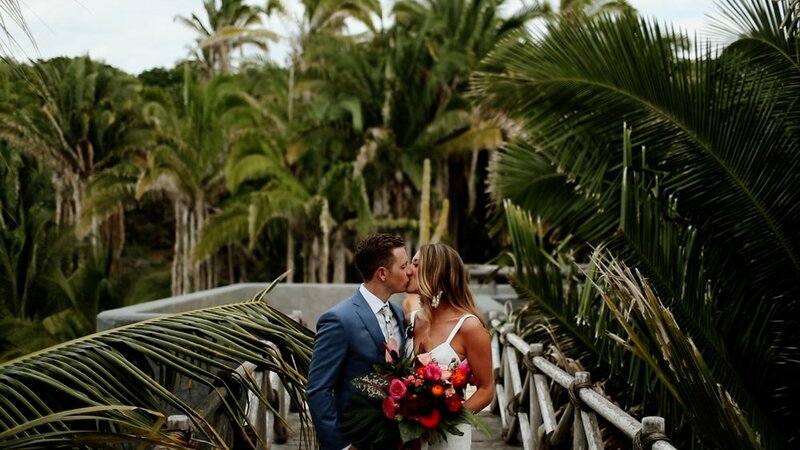 Carolyn and Slater shared a private first look on the wooden bridge at Teitiare Estate surrounded by hundreds of palm trees. Slater couldn’t hold back his tears when he turned around and saw his girl. It was the sweetest first look to witness. 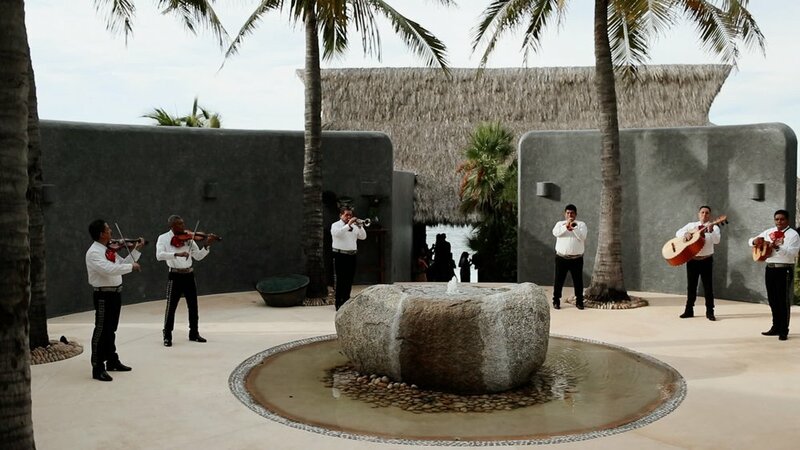 Guests were greeted at the Teitiare Estate to the tunes of a live Mariachi band and cocktails around the pool. The perfect start to their intimate sunset ceremony on the beach. Carolyn’s dad walked her down the aisle proudly with tears in his eyes as Slater waited for her at the end of the aisle with tears in his. Everyone clapped and cheered as she made her way towards him and it was the freaking sweetest thing we’ve ever witnessed. One of Carolyn’s bridesmaids officiated the wedding and included so many personal words about the two of them together as a couple. As the sun began to slowly set and the sky turned different shades of cotton candy, Carolyn and Slater vowed handwritten promises to one another. It was an emotional ceremony…filled with lots of laughter and happy tears, there was not a dry eye in sight as they promised to do life with one another and shared all of the things that proved that they were standing in front of their person. You could feel just how much love there is between them and just how loved these two are — as if you couldn’t already tell by their massive bridal party or the size of the crowd who traveled to be there with them! 150 people, to be exact. Their wedding planning team, Sayulita Dream Weddings, beautifully designed their tropical, boho garden themed wedding. It was such an honor and so much fun working with this incredibly professional and creative team who brought all of Carolyn and Slater’s dreams to LIFE. We were obsessing over every little thing the entire day! We had the chance to sneak away with Carolyn + Slater to film with just the two of them at sunset. That sky. Their love. These two. THE BEST. Their reception was one big party. There were the cutest lounging set ups all around the beach for guests to relax + enjoy cocktails, tequila shots, and margaritas. As dinner was being served, hilarious speeches were given by both the father of the bride and groom, as well as Carolyn’s maid of honor and Slater’s best man. Their friends and family were also able to enjoy late night churros, canapes, tacos al pastor, + photo-booth photos in front of their neon sign setup. Carolyn + Slater shared first dances with one another and their parents and the dance floor stayed packed the entire night. They gave their friends and family one of the COOLEST experiences through their wedding by gifting them a chance to make some incredible new memories in such a stunning place. If that doesn’t tell you everything you need to know about this couple, I don’t know what does. The best of the best. Thank you, Carolyn and Slater, for choosing us, trusting us, + just being so rad to work with.